The house was called to order at 7 o’clock, President Wilson in the chair, & proceeded to the regular order of business—There being no question for debate before the Society, this head was passed over. It was then moved that a Committee be appointed to suggest members of the Faculty as judges in awarding the Magazine medal. Carried. 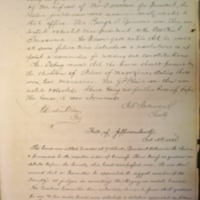 The Question Committee then submitted its report, from which questions for one and two weeks hence were selected & debaters appointed as follows: One week hence “Should the feature of ministerial responsibility be adopted in the Constitution of the U.S. cabinet?” On the Aff: Messrs. Reynolds. Andrews. Atkinson. On the Neg: Messrs. Lindsay. McLemore. Hughes. Two wks. hence. Question: “Is a bimetallic or a unimetallic standard preferable?” To be debated on the Aff: by Messrs. Lefevre. Patterson. Dabney. on the Neg. by Messrs. Youmans. Pendleton. Blair—The Treasurer then reported that he had paid the cost of publication of Govr Hubbard’s address before the Societies of last session. Mr. Lefevre moved the appointment of a committee to estimate the cost of refitting the Society Hall. Carried. Mr. Dabney moved that a committee be appointed elected to draught a new constitution & Bylaws—Tabled. Moved & carried to appoint a committee of four to canvass the College for subscribers to the Magazine—No further business before the house, the second roll was called & the Society stood adjourned. University of Virginia. Jefferson Society, “Jefferson Literary and Debating Society Minute Book,” 1880 October 16, WWP17258, Jefferson Literary and Debating Society Records, Woodrow Wilson Presidential Library & Museum, Staunton, Virginia.